Backlinks are arguably the most important component in Google’s ranking algorithm, because back links deliver all of the authority that a website has. As such it is pivotal to a website’s success to understand the strengths and weaknesses of your backlink profile. 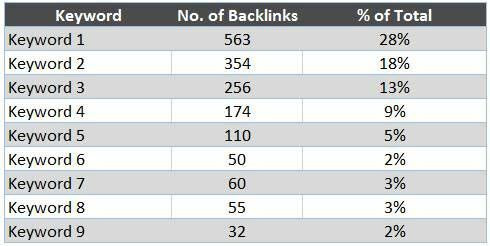 This article looks specifically at techniques and metrics that can help us to get a clear picture of your website’s backlink profile. We do not cover bad links or link building in this guide, follow the links to read more about those topics. Components of competitor analysis are touched upon in this guide, but are expanded upon more fully in our guide to competitor link analysis. This guide assumes some degree of knowledge, if you are new to the concept or are unfamiliar with terms link Citation Flow and Domain Authority, we suggest you read our introduction to backlinks first. This guide is aimed more at analysing larger link profiles than smaller ones… A site with a few hundred links could still benefit from analysis, but this guide will be more relevant when analysing thousands of links or more. It’s nice to do some quick top-level checks on a backlink profile when you first look at it, to get a feel for the type of profile we are analysing. It’s worth noting that backlink profiles can come in a huge variety of sizes and forms, depending on the business, the website, the products, industry, etc. We have to start somewhere and this is a good a place as any! We have set out below the top-level checks that you might want to start your backlink analysis with. These aren’t strictly forms of analysis, they are just quick checks that are easy to do to get a bird’s eye view of the link profile. 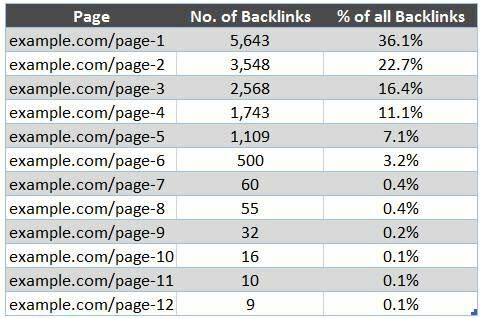 If you have a site that accounts for 30% of the backlinks to your site, it is worth removing this outlier from the analysis to get a clearer picture of the remaining 70% of your link profile. That is not to say you should ignore outliers, just that when performing an analysis, it can be beneficial to see the data both including and excluding them. If you are comparing your site data to that of your competitors, ensure that you apply this kind of technique consistently across all data sets… Meaning remove outliers from competitor data if you are removing it from yours. This means that a significant percentage of the linking domains are all hosted on the same IP address. This could indicate that all of these sites are connected in some way and may need investigating. The implication is that the site could be using link networks and potentially spammy tactics to acquire backlinks. To assess this further you would need to check the trust and quality of your domains sharing IPs. We cover this more in another guide concerning bad backlinks. This is an even stronger indication that the above is true, that the site has a lot of links coming from very few domains and even fewer IP addresses. Even if it’s not violating any rules or in danger of incurring a penalty from Google, there is likely an interesting story to tell in this data. The link neighbourhood is an analogy to an actual neighbourhood, is your link profile largely made of trustworthy links? To extend this analogy; a house in a bad neighbourhood will be worth less than the same house in a good neighbourhood. The same is true for websites, if your ‘link neighbourhood’ or link profile, is largely made up of untrustworthy sites then your site will be in a bad link neighbourhood! This is another way of assessing trust or quality in terms of your back-link profile. 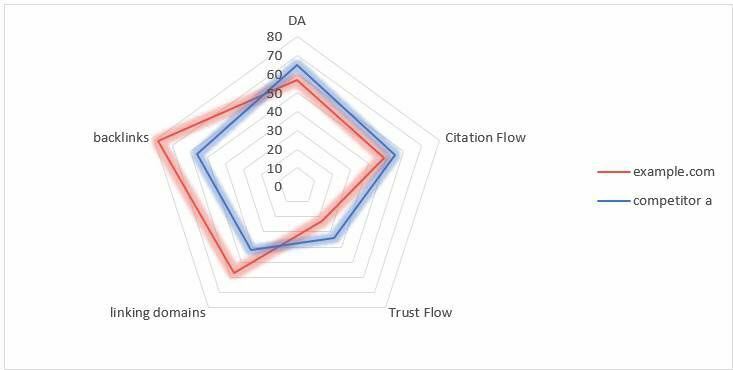 You can use whatever trust metric the tools you use provide for this analysis… If you use Majestic, you can use their Trust Flow metric, if you use Ahref then you can use DR (Domain Rating) or AR (Ahrefs Rank). This is an indication that the backlink profile is potentially very weak to potentially harmful. This would require a more in-depth analysis to see what is dragging the score down. There is no specific value that this ratio should be, but you want follow links not nofollow links… So, if the number of follow links is very low as a ratio; there may be opportunity to improve them through outreach. This doesn’t provide much insight, but if there are significant amounts of image links, it is worth then analysing the linking image alt tags for keyword optimisation. Check the number of root domains that link to your site as this is considered a major ranking factor. In order to perform this analysis, you will need to crawl your website for a list of all external links, and reduce this to just unique domains (removing the pages). In this example, you can see that the highest authority domain has fewer links pointing at us than we have pointing at them. This is a net loss for us as more authority will pass to them than to us in this equation. To some extent you can remove these domains from other components of the analysis as they are not like for like data compared to the other domains linking to your site. Reciprocal linking will significantly reduce the value of the link to your site. This analysis could highlight the need to nofollow your links to these sites. Collate a de-duplicated list of all pages on your site being linked to from your backlink data. Then crawl these pages to ensure that they are returning a ‘200’ status code, meaning that they are accessible. Consider either setting up redirects or creating pages on these URLs if you are unable to get the link updated. With or without the www. Ensure that all of the correct redirects are in place to mitigate any lost authority from links pointing to non-canonical URLs. Ideally get high value links updated to refer to the preferred canonical URL. Looking at the historical backlink data for your link profile can be a valuable exercise, one of the things to look for is the stability of the link profile. Plot the links gained and lost each month over a long period of time to evaluate them for extreme fluctuations, unnatural looking gains or concerning losses. In the example below we can see that the links gained and lost jump around month to month, links are gained more than they are lost. We can also see that this fluctuation sits within a small bracket of deviation most of the time. The above chart would indicate a short period of instability in the recent past, but is an isolated incident that will likely have a logical explanation. What makes his type of view particularly valuable is that you can correlate it with other data such as; keyword ranking data and traffic data. The chart above shows that the site lost a huge amount of links in one month, the following month lost a lot of traffic and traffic has been declining ever since. By comparing Backlink frequency with ranking and traffic data, you can identify problems or explain success… In either case there are actionable insights that can be drawn from this type of backlink analysis. In an ideal world, we want to see our backlink profile growing steadily and incrementally over time. We don’t want to see it jumping up in large unnatural spikes suddenly and frequently. In the real world, there will always be fluctuations, but the aim is to see a link profile grow not decline over time. In order to set link acquisition targets, you will need to know how many links your profile grows by each month. Massively increasing this number can look suspicious which can result in a penalty from Google. If you are planning on building a backlink acquisition strategy, you will need to analyse this type of data. Another important factor to consider is how many backlinks your site is acquiring each month from unique domains. What we mean by this is; how many domains link to your site each month that do not already link to your site? It’s also worth looking at this a percentage of the total linking domains. This number is most useful when setting link building targets, ideally you want links from domains that do not already link to your site. This is the name we have given to an analysis technique which we apply to a number of data sets when analysing backlinks. We have given three examples below that we feel are the most valuable but once you finish this section, you can apply this technique to other data sets. This is a technique for analysing the authority of your site’s backlink profile (and those of your competitors). 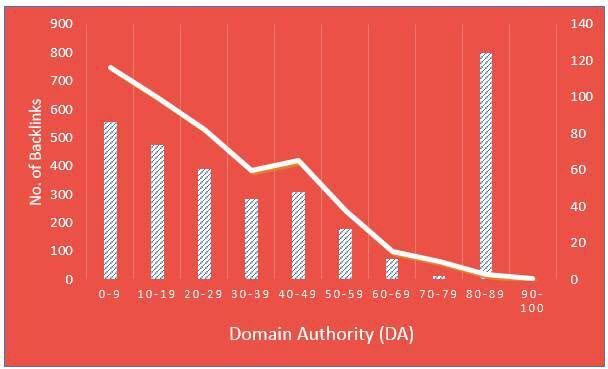 You will need to use your preferred metric for authority such as Moz’s domain authority, they are all typically a score between 0-100 with 100 being the best. The table below shows two columns; the left-hand column has DA (Domain Authority) grouped into brackets of 10. The right-hand column shows how many backlinks your site has for the corresponding bracket of DA. In the example data below, you can see that this site had 484 backlinks from domains with a DA of between 20 & 29. The chart below shows the data in the table above, this makes it easier to see the distribution of backlinks based on their DA. This would be a red flag that perhaps some aggressive and potentially harmful link building has been undertaken. Or it might represent a single high authority site linking to your site over 800 times; seeing this would be cause to investigate further to establish if there is potential for harm. 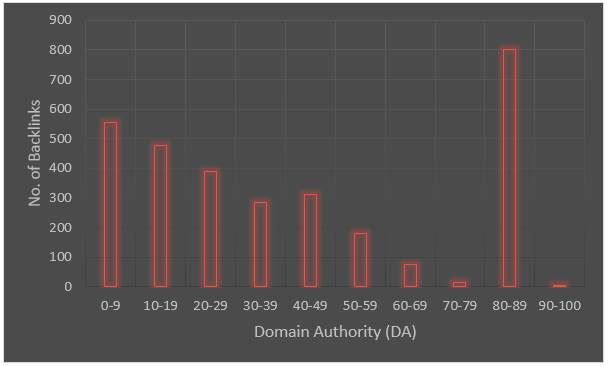 In the above chart, we have shown the number of referring domains for each bracket of DA on a second axis, this reveals that this spike of 800 Domain Authority 80-89 links come from just 3 domains. Adding additional layers of data can often help to fill in missing pieces of the puzzle or explain or provide context to other data. Analyse the authority distribution of your site to ensure that there are no anomalous spikes or sudden drops that could indicate a poor link building strategy. Using a technique very similar to that described above but for a completely different purpose, we can look more deeply at the distribution of backlinks throughout your site. Typically, the home page will be the most linked to page, but this distribution has the potential to highlight a range of issues or areas of interest. The chart below is a pretty average or typical distribution of links to a site. Internal pages being heavily linked to could be an indication of valuable content, identifying the nature of why this content attracts so many links could provide ideas for similar types of content. Conversely if you have entire sections of your site that do not get linked to, it may be an indication that this content is less attractive to people wanting to link out. 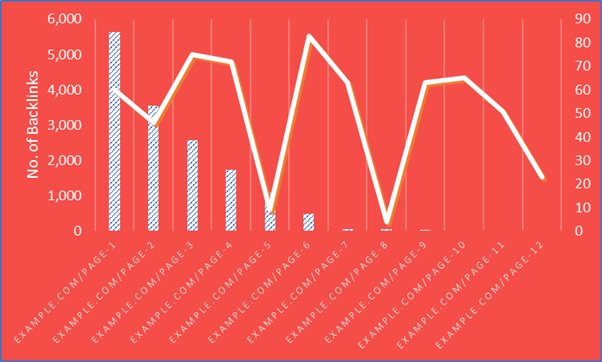 Correlating this analysis data against organic traffic data has the potential to reveal correlations between pages with the most links and those that get the most traffic. 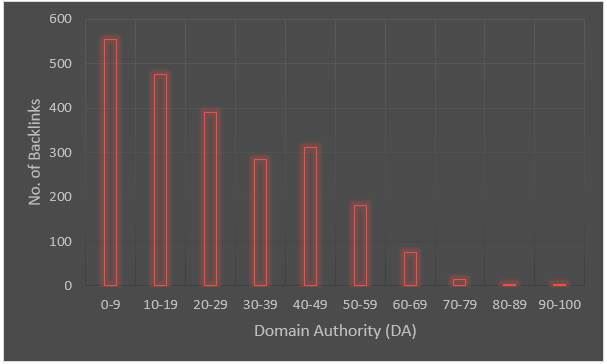 Combing both of the previous analysis techniques, we can look at the link authority distribution across your site. The chart below helps to visualise this data more easily, where we can easily see that there are two pages that have very high authority links. The follow up to this is who is linking to those page, why, what makes them so attractive to high authority sites? If answered, all of these questions can help deliver actionable insights that can amplify and align your content and link acquisition strategies. For example, the above data could be the result of a white paper that you published containing valuable and unique data about something in your industry; and this attracted links from major news sites who used the data in a story… Journalists will very often link to data sources, so producing similar data or regular updates to it could replicate the success we see here. This is just one of an infinite number of potential explanations, but performing this analysis will help you to ask the right questions. 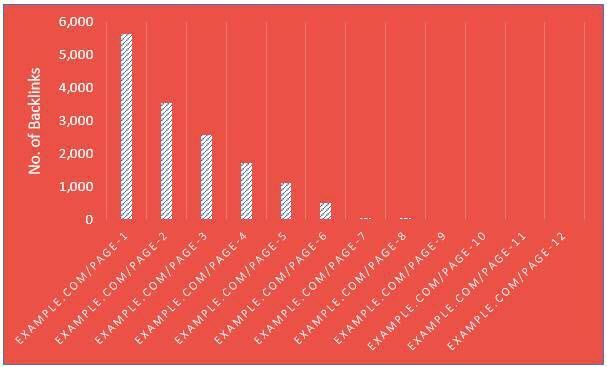 As a small part of this analysis you can also look at the ratio of deep links to home page links. This metric is more useful in the context of competitor data where you can see where your data sits in the competitive landscape. 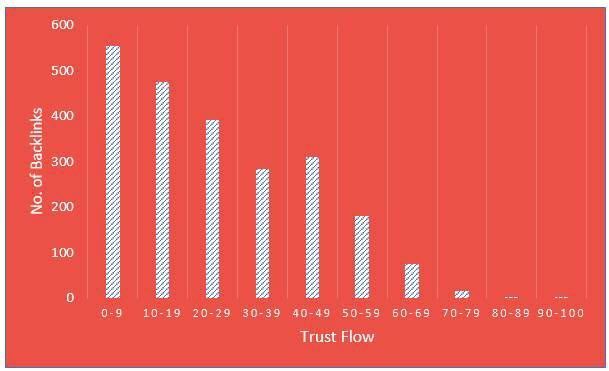 The methodology for this technique is the same as looking at authority distribution… but instead of using Domain Authority as we did in the above example of authority distribution, we would use a trust metric such as Trust Flow from Majestic. 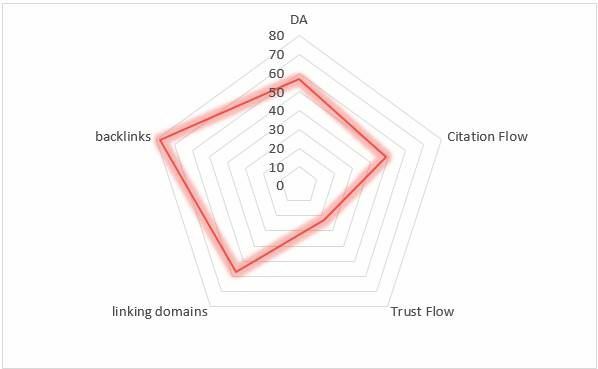 The chart below shows some example data, where the trust metric is broken into brackets and represented on the y axis as volume of backlinks or referring domains. Use this technique to identify unnatural spikes or high volumes or weighting towards poorer quality links. 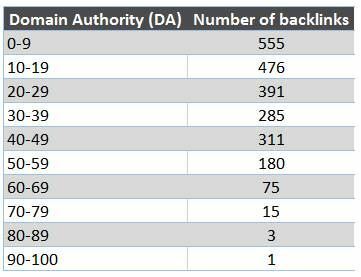 This chart although just example data, shows a clear trend; the middle tier of DA backlinks is growing relative to the other groups… Meaning that the over mix of links by authority is improving over time. You can use this same technique with any metrics to view the mix of trust or quality across your link profile over time. You should be looking for large spikes or drops that could indicate aggressive or potentially harmful link building strategies. As part of our comprehensive suite of SEO Tools and Backlink Analysis Tools, we have a visualisation tool that enables you to easily visualise the distribution of authority throughout your site. We algorithmically calculate the authority passed on to your site from each domain, processing the distribution based on internal linking, redirects, canonicalization and external links. This paints a picture of your site from green to red showing where the most authority resides, collects and is lost. We have discussed techniques to analyse the distribution of link authority throughout your site, but it is also useful to look at the highest and lowest authority links that your site has. Look at the linking domains with the highest authority, determine what they link to and if there is a pattern. For example, do they all link to news stories or blog posts, data or videos… Was it something funny or useful that attracted your best links? Ultimately you want to know whether it is something that you can replicate. If you do not have linking domains with what could be considered a high authority, this assessment is in itself the first step in an actionable insight; you need to get some high authority links. It is always worth manually reviewing some of the lowest quality / trust backlinks to ensure that you do not have spammy sites linking to you. Review the URLs of linking pages to ensure they do not include words that are often associated with the less trustworthy parts of the web, such as Viagra and adult terms, gambling, etc. This is covered in more detail in our guide to bad links. Look at the authority (using your preferred metric) of only the unique domains linking to your site, this will require you to either create or filter a list of linking domains such that it doesn’t contain any duplicates. 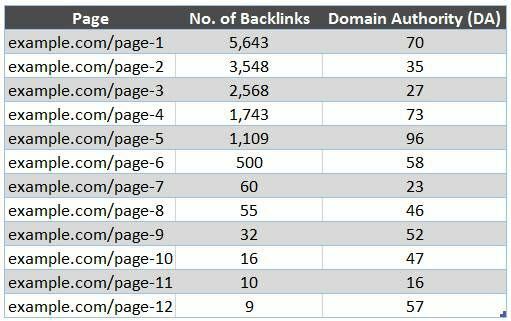 This is the most accurate reflection of the authority related backlink data that you can consider, because a million links from a single site does not provide a million times the authority of one. There are a number of ways that you can look at anchor text, we have set these out below. In this example, the brand name and the domain name are the most common anchor text used. You need to evaluate this data for obvious spam, overuse of keywords, general health and opportunities for optimisation. 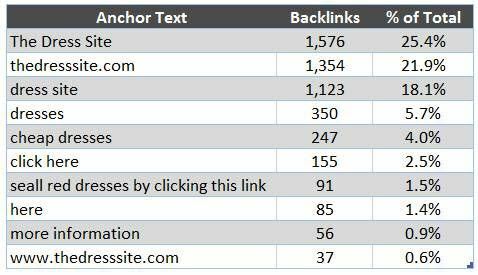 Comparing / correlating the keywords used in the anchor text with ranking data (organic position and ranked URL) has the capacity to identify patterns that can indicate the effective value of the links and anchor text. The anchor text variation would be 37% in this example. On its own this metric can provide some insight, but when shown in the context of competitor data you get a better picture. We discuss this in more detail in another guide. Count the anchor text containing the brand and brand variations, and the domain name for your site. This can be viewed as a ratio by dividing this number by the total number of anchor text links. As in the above example to see what percentage of your anchor text contains the brand and related terms. Your brand should occupy a significant portion of your total anchor text, and is one of the safest and more relevant ways to link to your site. Count the anchor text containing target keywords. This can be viewed as a ratio by dividing this number by the total number of anchor text links containing a keyword. 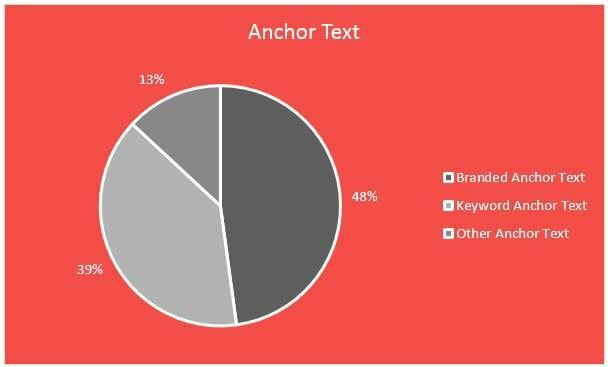 As in the above example to see what percentage of your anchor text contains keywords. This should be kept under 50% to avoid potential penalties from Google. Comparing this to your target keyword list and your ranking data can provide insights into the relationship between anchor text links and rankings. We cover excessive keyword usage in anchor text in our guide to bad links. This will provide a good top-level picture of how safe your anchor ratios are. 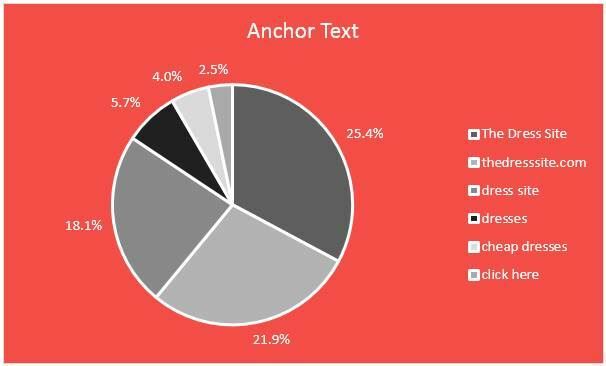 Beyond this, analysing the anchor ratios can provide actionable insights in terms of what keywords you should be using in your future link building and what to avoid. Where ‘buy red shoes’ (partial match) or ‘buy red shoes online’ (exact match) are both valuable keywords that the site is trying to target. This is something that Google devalued in 2012 with an algorithm update, but the reality is that these domains can and do still provide some advantage. Exact match domains can be spammy or legit, with potentially more room for spam than your average domain. As such you need to consider this when looking at the use of exact match domains in your link profile. We cover this in more depth in our guide to competitor link analysis. A good way to get a quick overview of a site and its backlinks is to look at the data in a radar graph. We have indexed the backlinks and linking domains in the below example. Our the Backlink Tool, which is part of Raptor's SEO Software, performs all of the checks and analysis discussed in this guide and much more, we are launching a Beta in late 2017, sign up today to get free access to the Beta and 2 months free usage once we launch in early 2018.